gothic corset, hourglass shape, sturdy "CU2 Black Mesh Underbust"
Made of strong, thick, black mesh with waist tape, which serves as protection for the seams. On front there are flat bones with five parts busk. Outstanding! Well made and very comfortable. My measurements are 35/27/37, i.e. quite a strong natural curve. I bought size 22. The underbust and waist area are seriously perfect, the hip area is a bit too big/too high, which surprises me as I have a very short torso, BUT I think once fully seasoned and tightened up it will probably even out and be fine. I wear skirts and dresses every day so it's not really a problem. Excellent value for money, highly recommend! Just got my corset today and it fits perfectly! Measurements are 34-27-34 and I got the 22" corset. Really looking forward to seasoning it and I hope it gives me the hourglass shape that I want. The corset is very well-made and sturdy, totally worth it for the price. Would highly recommend. Very beautiful corset, it's sturdy and well made. Looks very durable too. Sadly, it was not suitable for my shape, I ordered the 20" inch size but it seems I don't have the hip s hapeto carry off such a curvy style corset, it was too large on my hips. Though it isn't suitable for me, I would still recommend this corset is you have a good booty/hip shape. It's a stunning corset and the quality is *very* high, something which I didn't expect since the corset isn't very expensive. In fact, I rate the quality just as high as a custom made 200 dollar corset that I have, so I'm still giving this a 5/5 rating despite not fitting it (which is my own fault). 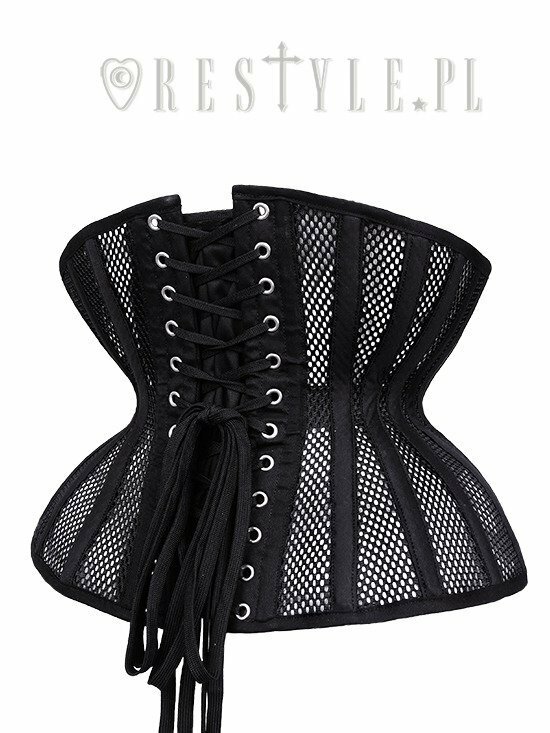 Hoping ReStyle will make a more traditional/classic shaped mesh underbust corset in the future, cause I love mesh corsets and I would buy it from ReStyle in a heartbeat! The order got delivered quite fast which had me surprised! I ordered a size 22 and the measurements were true to the description of the website. The corsets seems very sturdy and well-constructed, and I was able to remove the modesty panel easily (it's sewn-on). As for the fit, I found it a bit tricky to fasten since I'm used to straigther busks, but once fastened a few times I got the hand of it. As for the laces, I would preffer some smoother laces rather than this shoolace-type, but I can't complain for the price, and they seem sturdy! The corset itself seasoned very fast since it's mesh and is very comfortable to wear. As for the shape, it's definetly very curvy. Even though it's a bit rounded in the ribcage I feel it looks kinda conical from upside, which I really love! I am considering to order another one of this CU model in another fabric because of its uncomparable price-quality relationship in the corset market. To sum up, I would really recommend this model! Tbis is my second corset, the first one from Restyle. I gotta say, this corset is really really well made: really sturdy, accurate shape, pretty well sown, comfortable... the only concern i might have are the laces. Because of the "shoe lace" they get stuck from time to time in the grammets. And the corset is a bit short for mi torso, i can't say anything, is a mass produced corset. But overall i'm really really pleased with this corset. I will buy more from here certainly. The first Restyle I bought. As it's close to my measurements (at rib and hip) this seasoned really fast. It's supersturdy and as curvy as it looks. The only downside is the front busk wich is very flexible and a bit tricky to fasten. It's really well made, sturdy and most importantly comfortable. Well worth every penny! Pro’s: -Very sturdy due to lots of boning, waist tape etc. -Well sewn, no loose threads or things like that -Mesh corsets are very rare -Low price => very good price – quality ratio -Relatively short busk, which means no pushing in the breasts like many underbust corsets do. -Big difference between the waist and the ribs and hips. -Fast shipping Cons: -Not as curvy at the low ribs and high hips as pictured. For me, this gives quit a lot of room at the high ribs and a bit of room at the low hips. -It has a modesty panel which not realy needed for a mesh corset. This could be just my opinion though. In summary, this CU model is very good for girls who want to train their waists and already have quit some difference between their waists and their ribs and hips. Maybe choose a size smaller than you would usually do. For my muscled body I’ll need to sew some darts at the high ribs and low hips. I ordered the corset about a month ago and it arrived within i think 8 days (poland-austria, europe). the corset itself is true to the description on the website, its pretty sturdy and relatively heavy due to the steelbones. the mesh has very little to none stretch to it, so its holding its shape very well. the busk is flexible so if you prefer (lower) tummy support this shape might not be right for you. also it is rather short in general (again, as stated in the description, so no surprise), so make sure to match your underbust- and hip measurements when chosing your size, otherwise its gonna give you muffintop. i have another one in the WH shape too, and shapewise i prefer the WH. both are pretty curvy though and comfortable to wear. all in all i think this is an alright corset for warmer weather and for this little money it really is a bargain. no complaints so i give 5/5 stars.